If this describes you, sign up on the right and download now. 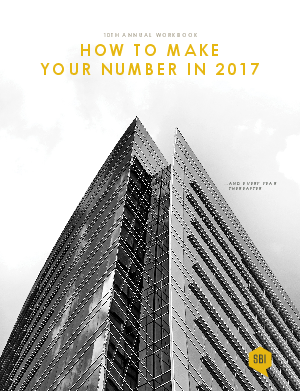 This workbook will significantly increase the probability of you making your number in 2017. It teaches you the emerging best practices from the world’s top growth leaders. These are leaders in the top 22%, those who consistently grow their revenues faster than their competitors, and faster than their industries. To net it out, there is one thing they do that others don’t. They hit their revenue growth number every year. The average executives, the remaining 78% are inconsistent. They make their number one year, miss it the next, make it one quarter, miss it the next, and so on. You need to download the workbook, and go through the exercises to learn the specifics, but let us try and sum it up in a few sentences. Best-in-class growth executives blend strategy and execution masterfully. They understand that this quarter’s results reflect actions they took a year ago. And next year’s results will be determined by the actions they take today. Growth executives in the top 22% work on strategy, and tactics, together in unison, resulting in making the revenue number always, in a predictable, hassle-free way. It is easy to be good. It is difficult to be great. If you want to be great and grow revenues faster than your competitors, and your industry, download this workbook. We have codified these emerging best practices in a methodology you can implement at your company. It is called the Revenue Growth Methodology, or RGM for short, and it is your ticket to a great 2017, and every year thereafter.